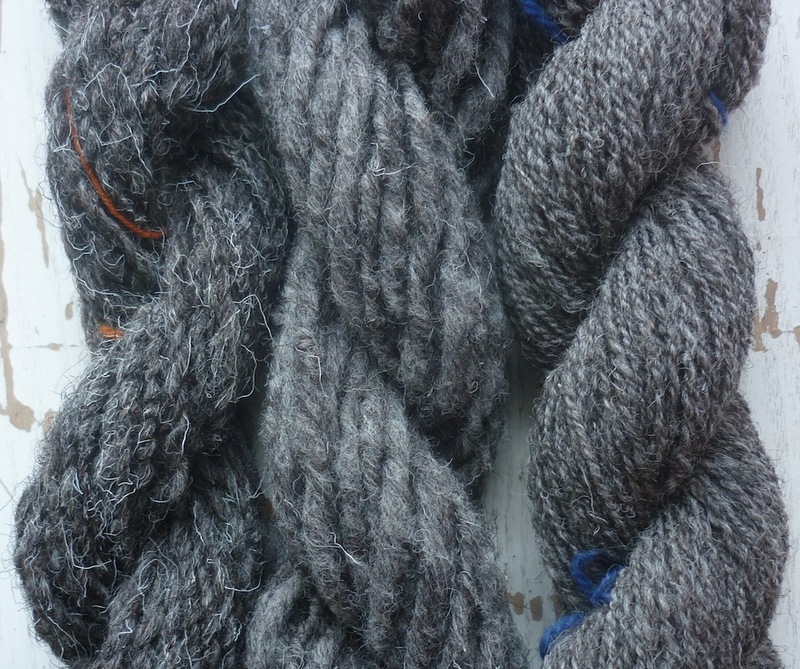 A couple of weeks ago I returned from Shetland Wool Week. 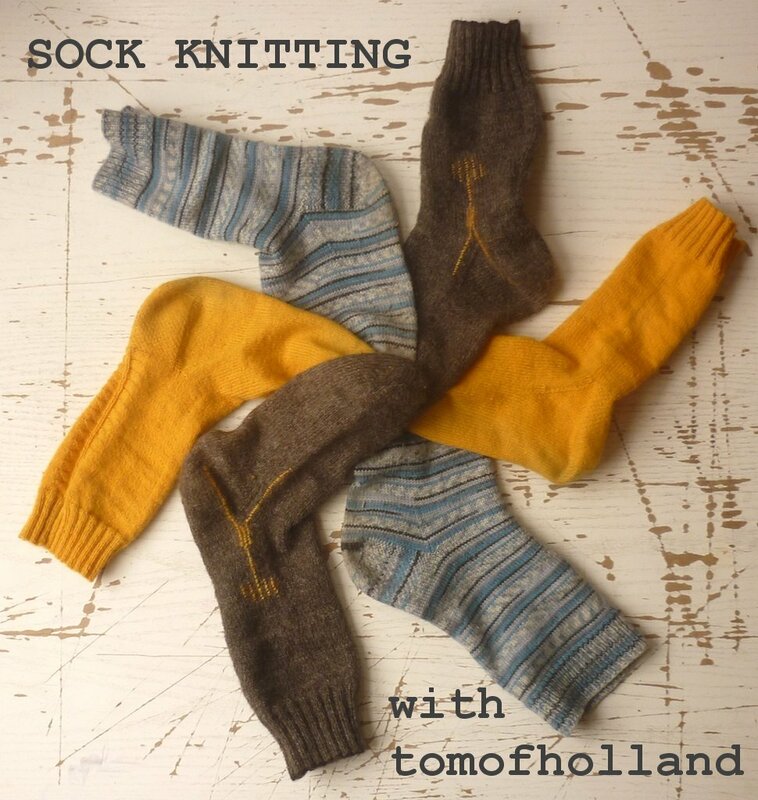 I was invited to run two darning workshops, and to present the works-in-progress of the Aleatoric Fair Isle project I’m working on with Dr Felicity Ford. 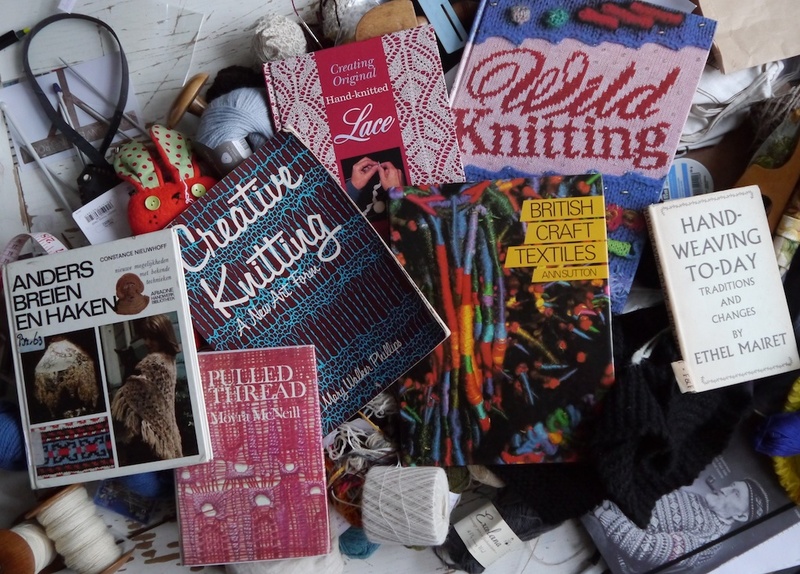 I have met so many amazing people, seen impossible feats of spinning and knitting, and enjoyed the landscape. The view from our log cabin – we stayed at Nortower Lodges, and we couldn’t have wished for a better cabin. 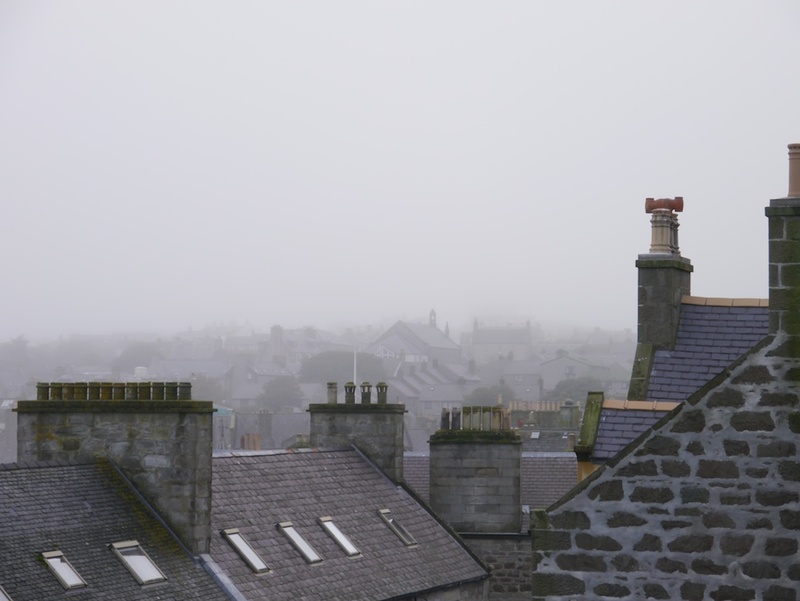 The view from Fort Charlotte, in the centre of Lerwick. Luckily most days the weather was much nicer than these two pictures would have you believe. 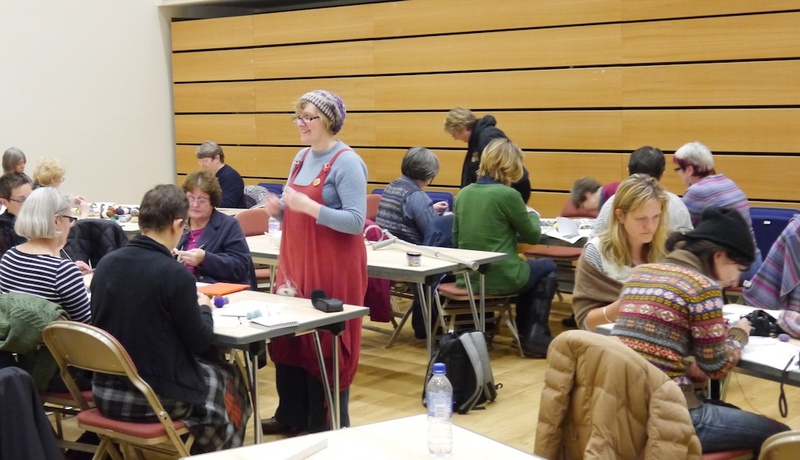 Felicity helping out participants of our Aleatoric Fair Isle workshop. 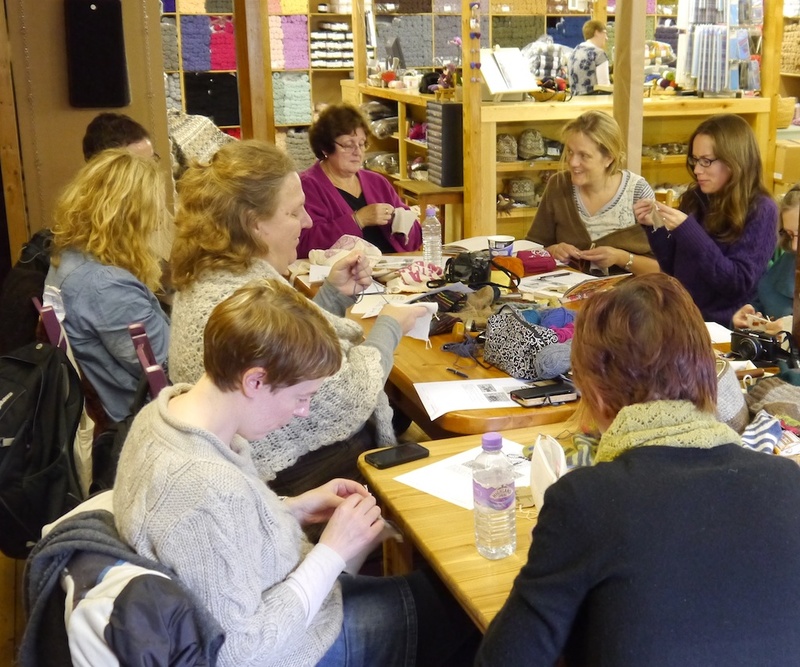 Rolling the dice and following rules to create Fair Isle swatches proved controversial in some quarters, but I think we all had a good time in the end. A fine Shetland Ram at the Flock Book Ram Auction. 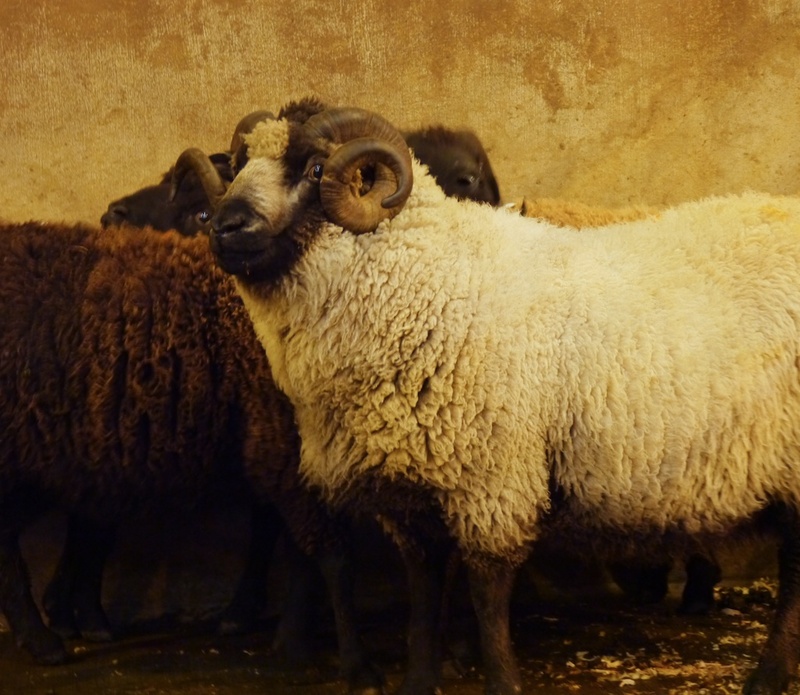 In order to prevent an ever dimishing gene pool within their flocks, sheep farmers sell off their rams, and buy new ones frequently. 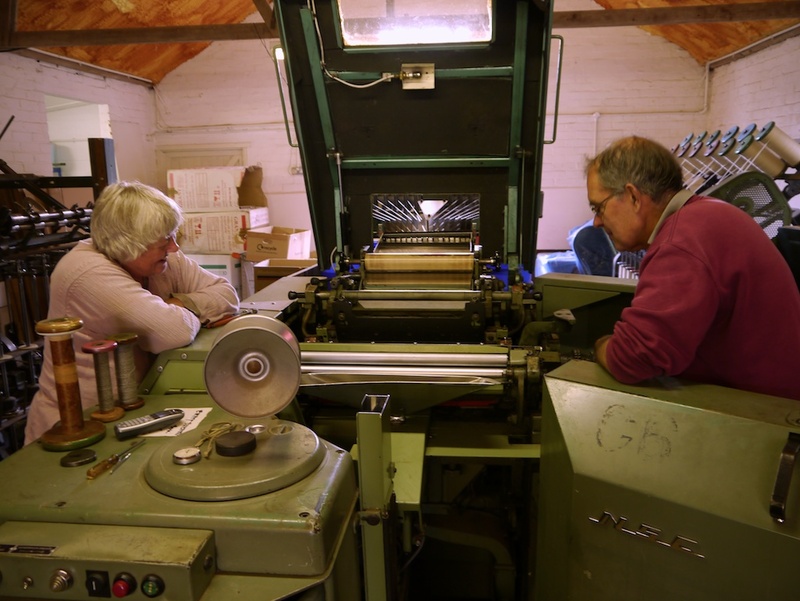 A visit to Jamieson’s of Shetland‘s mill in Sandness. 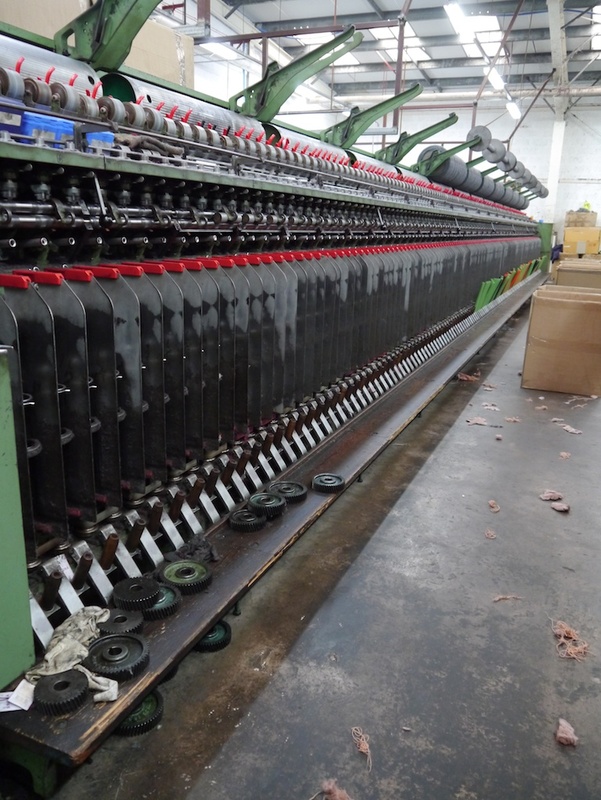 One of many banks of spinners; in many ways a very different affair from Diamond Fibres Mill, which I visited recently. Jamieson’s spin their fibres with the woollen method, resulting in a lofty, warm, yet light yarn, very suitable for Shetland wool. 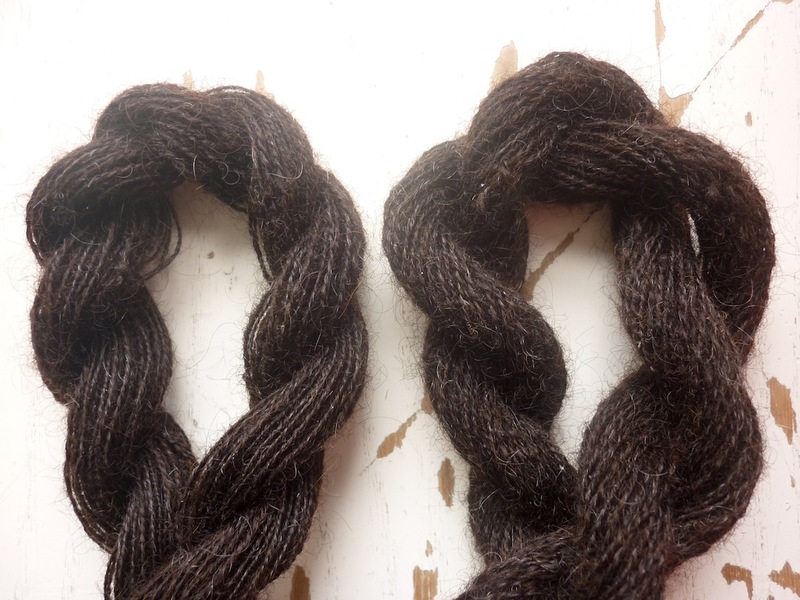 Diamond Fibres on the other hand, specialise in the worsted spinning method, which is much better suited for longwool (like their own flock of Romney sheep) and this makes for a smooth and lustrous yarn. 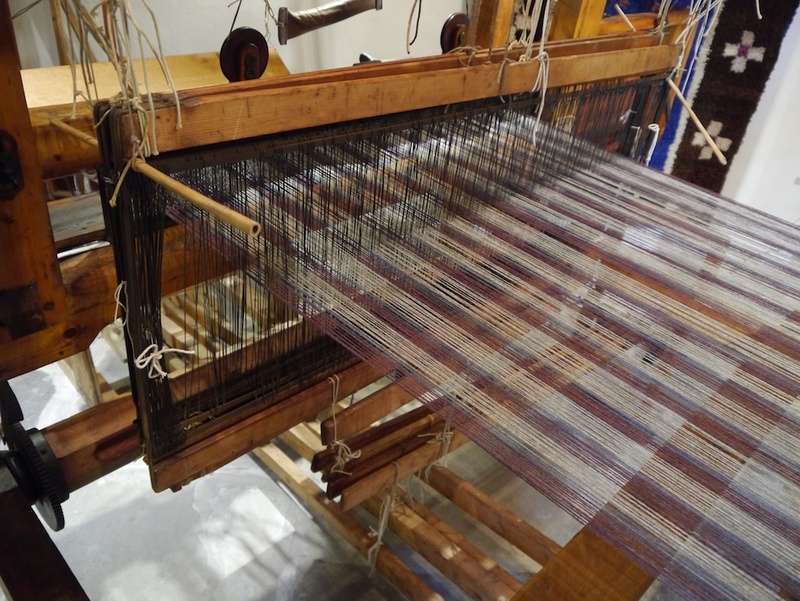 The Textile Museum has a working loom, as found in the traditional crofts. 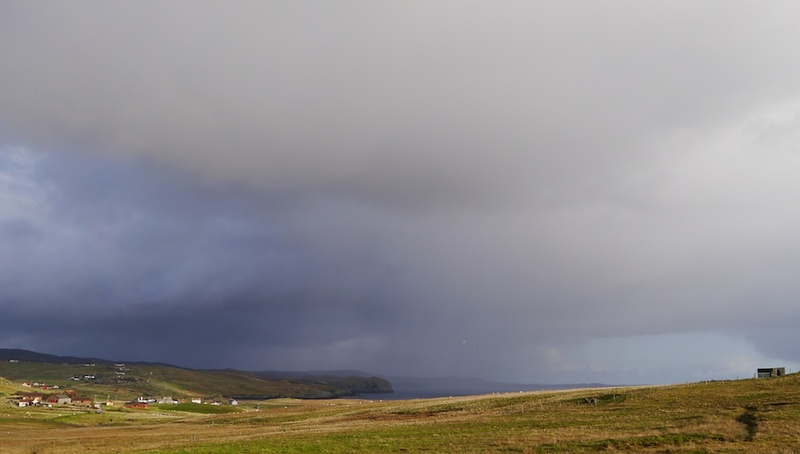 Until my visit, I never knew that Shetland once was also famous for their tweed fabrics. As part of the Flock Book Ram Auction, there was also judging of the best rams. Here are the Shetland hot shot rams, all together in a special judging area. 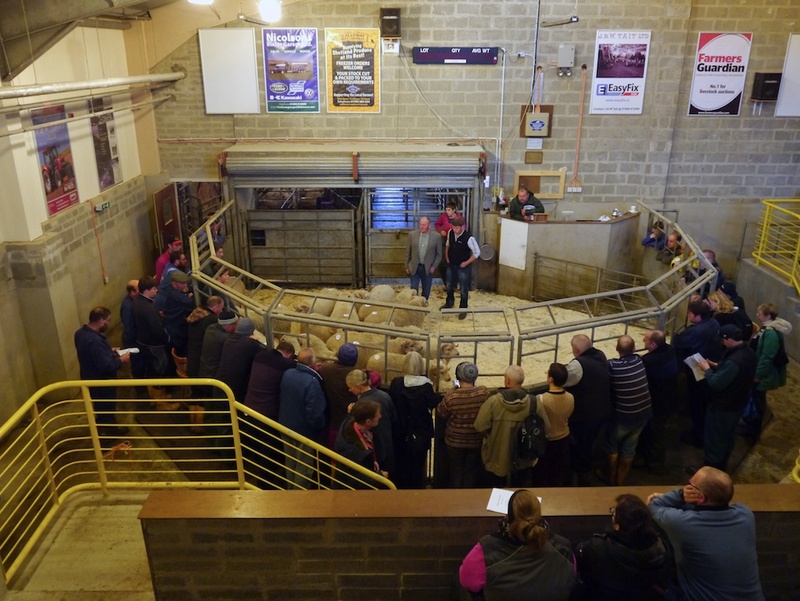 The atmosphere was palpable and tense, as a price-winning ram means a lot to the owner. And here is your good self. Elizabeth Johnston, spinner and dyer extraordinaire, showed me how the Shetland lace spinners managed to get such exceedingly fine yarn. 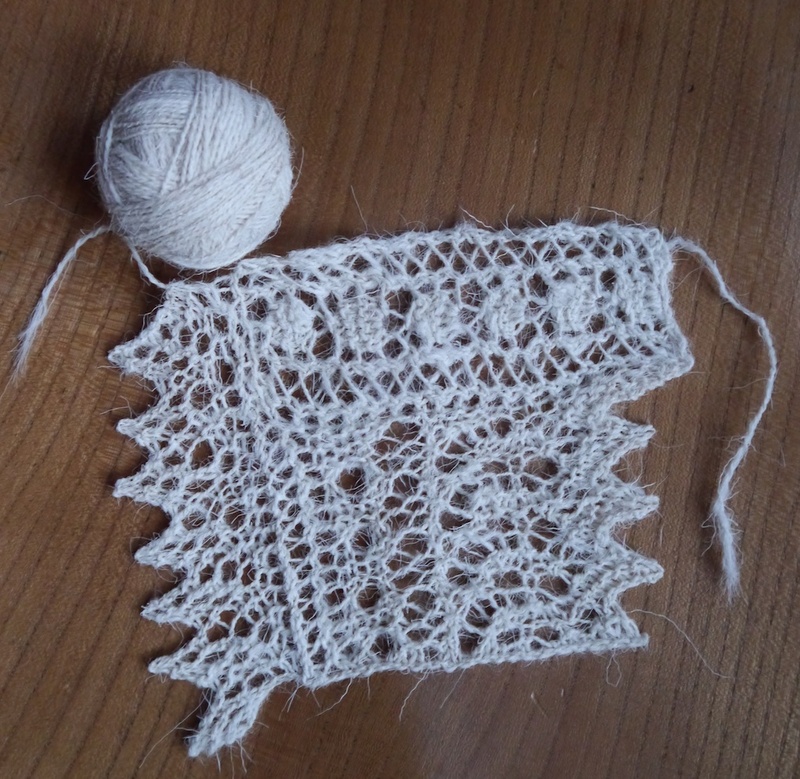 After three hours of blood, sweat, tears, and some rather flowery language, I managed to get some extremely fine yarn. 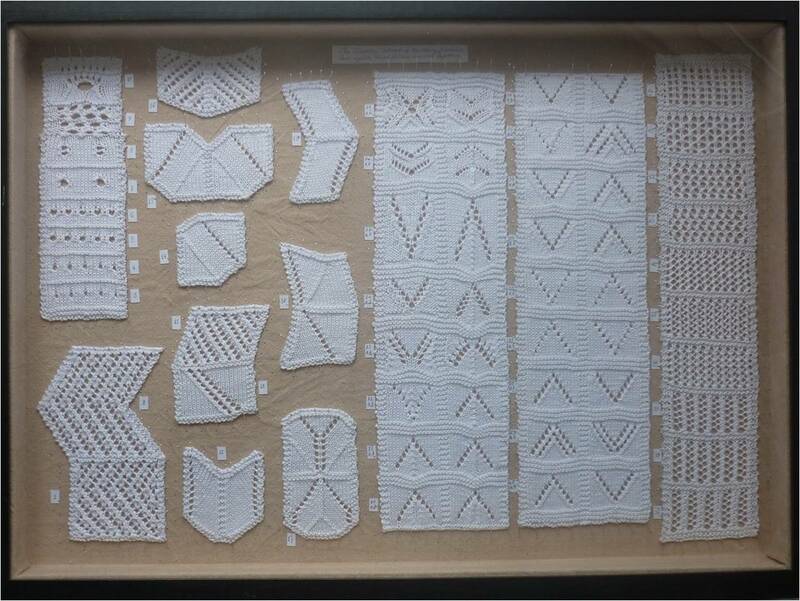 Elizabeth told me that I had started to understand the technique, but that my thread wasn’t near fine enough… The aim is to make a single ply the thickness of six individual fibres. This will then be used to make a two-ply yarn. I will keep on practising! 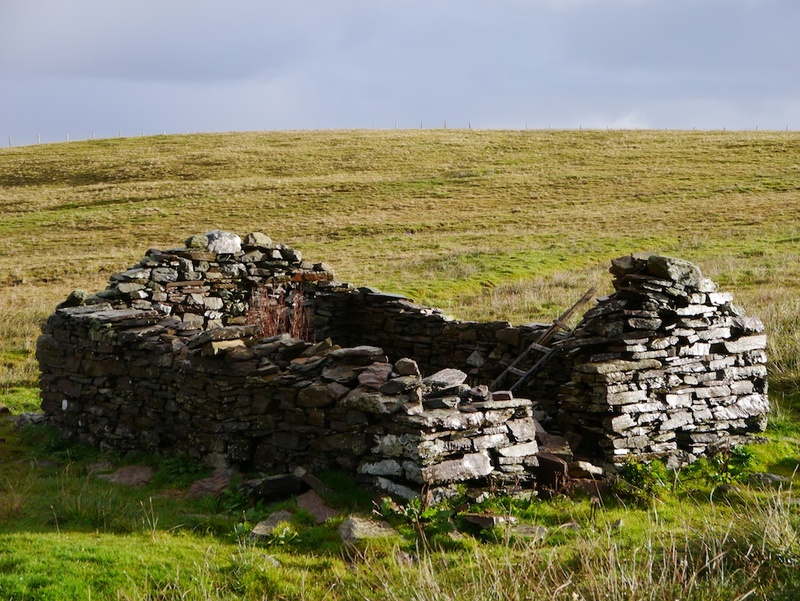 This delapidated croft was not far from our lodgings, so we passed it every day. 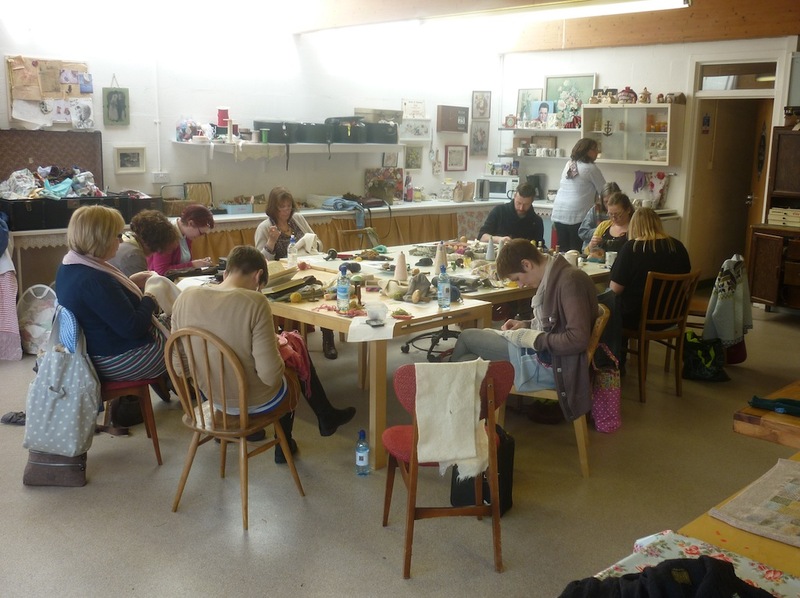 I also ran two darning classes. 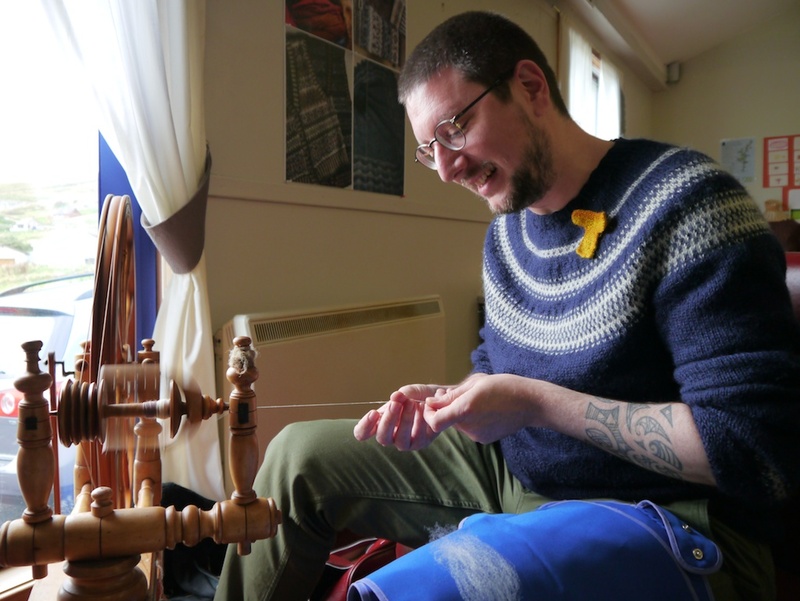 A drop-in session took place at the Shetland Museum and Archives, who helped organise Shetland Wool Week, and who invited me to come over in the first place: so a massive thanks to them for making this visit possible. 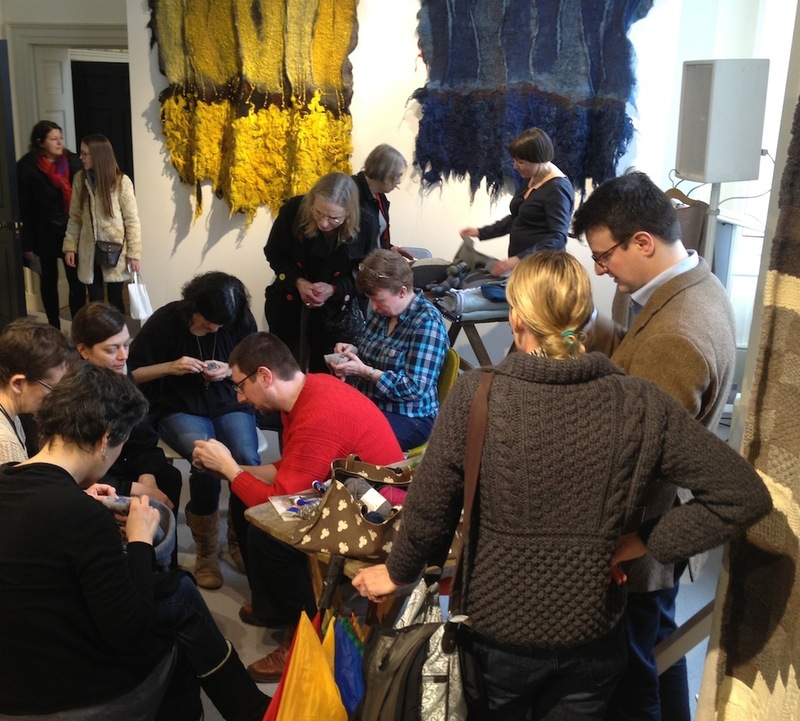 Secondly, I ran a darning master class at Jamieson & Smith, pictured above. 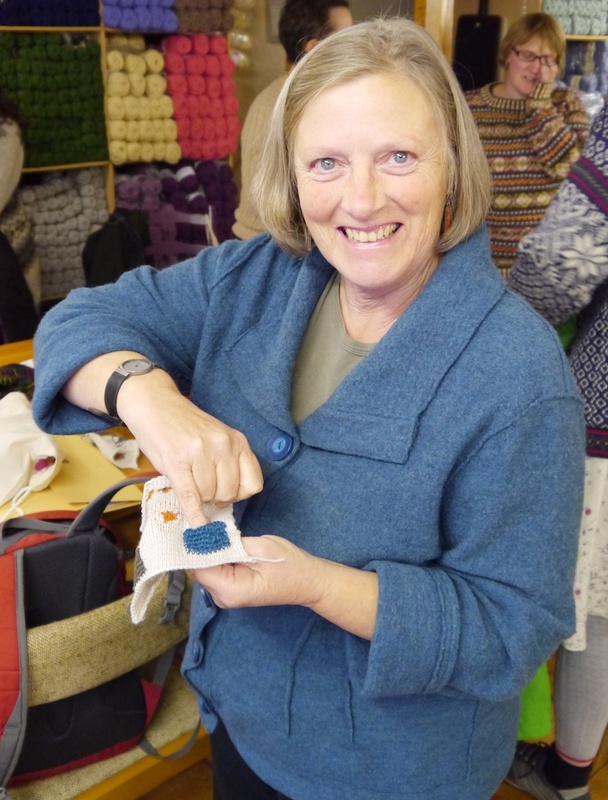 More thanks due here, as they kindly provided Felicity and me the yarns for our workshops. 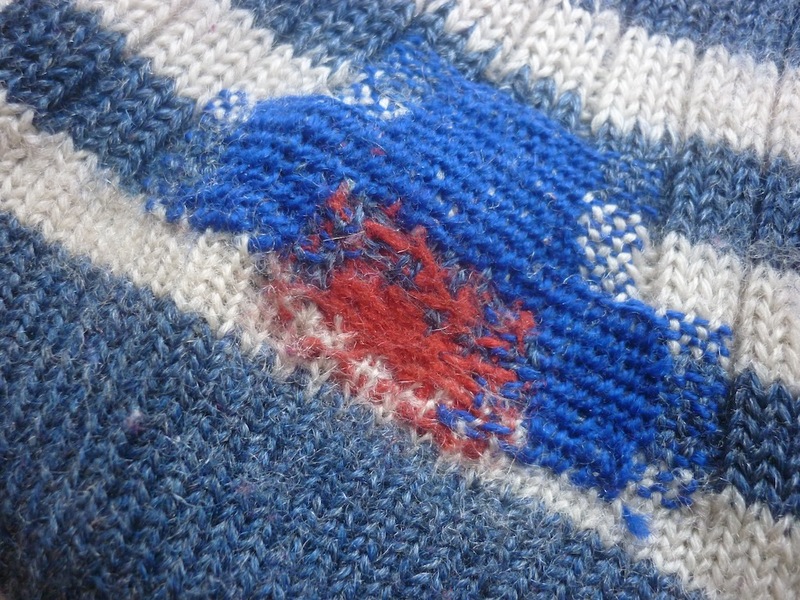 Susan Freeman found a new application for the Scotch darning technique. 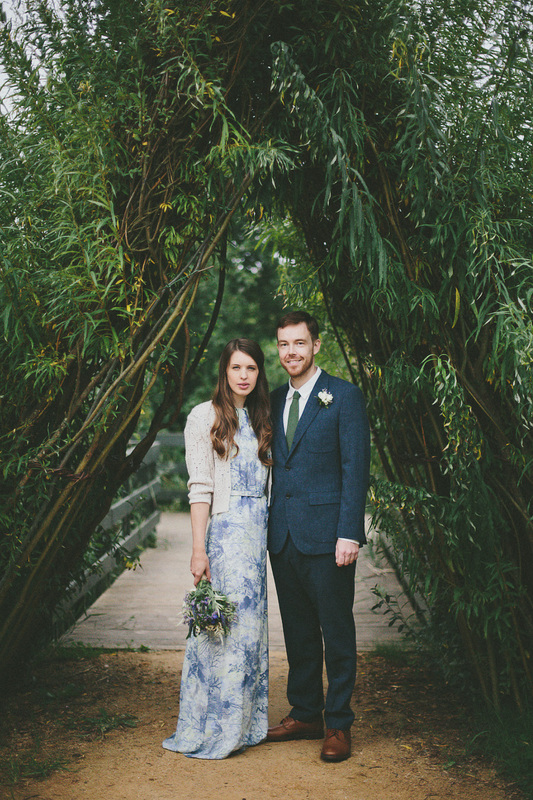 As you can clearly see in this picture, you can make pockets! I think I will have to add a fountain pen pocket to one of my cardigans. 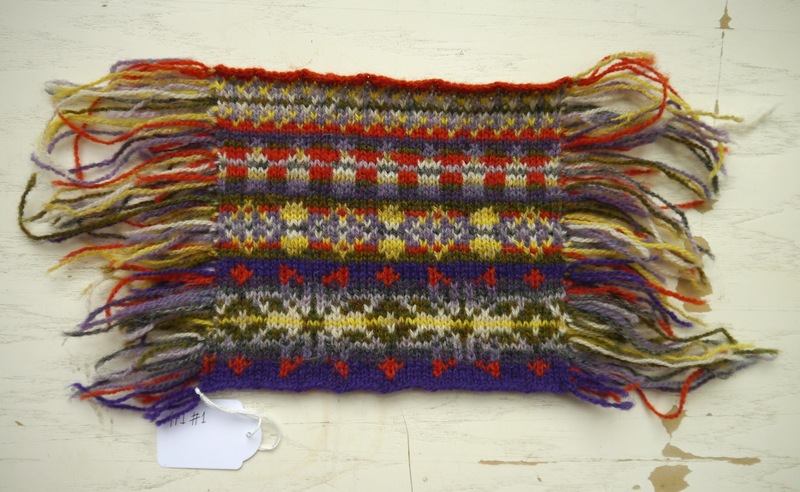 And here is a beautiful gift from Diane Houdek, who came all the way from America for Shetland Wool Week especially. 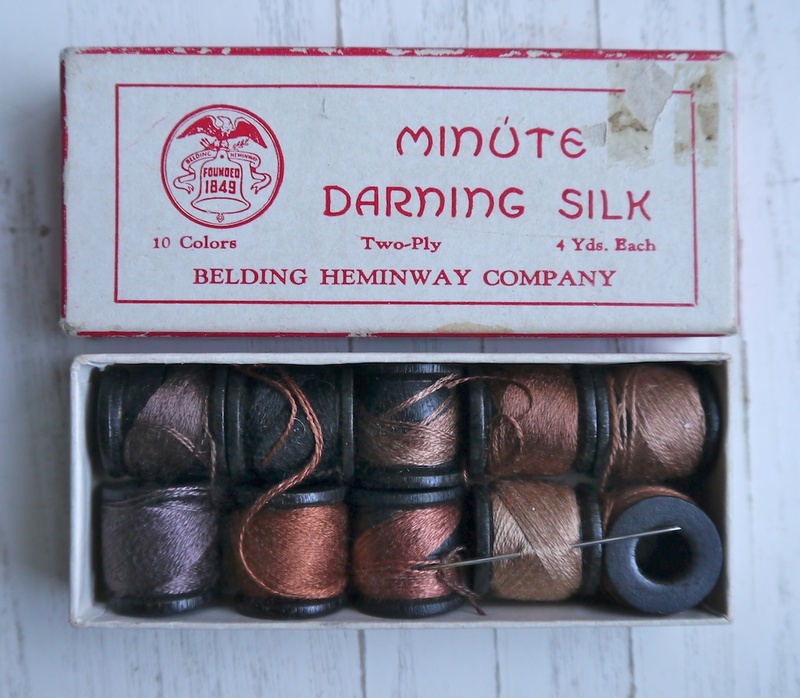 A small box with teeny tiny wooden reels of darning silk. What a magnificent addition to my collection of mending ephemera! 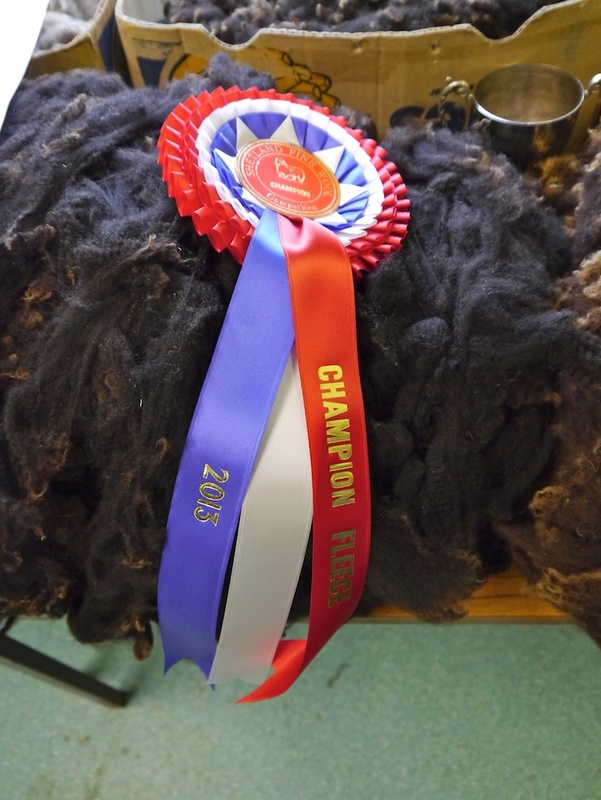 The fleece in this picture was chosen as the Champion fleece during a fleece-judging competition. 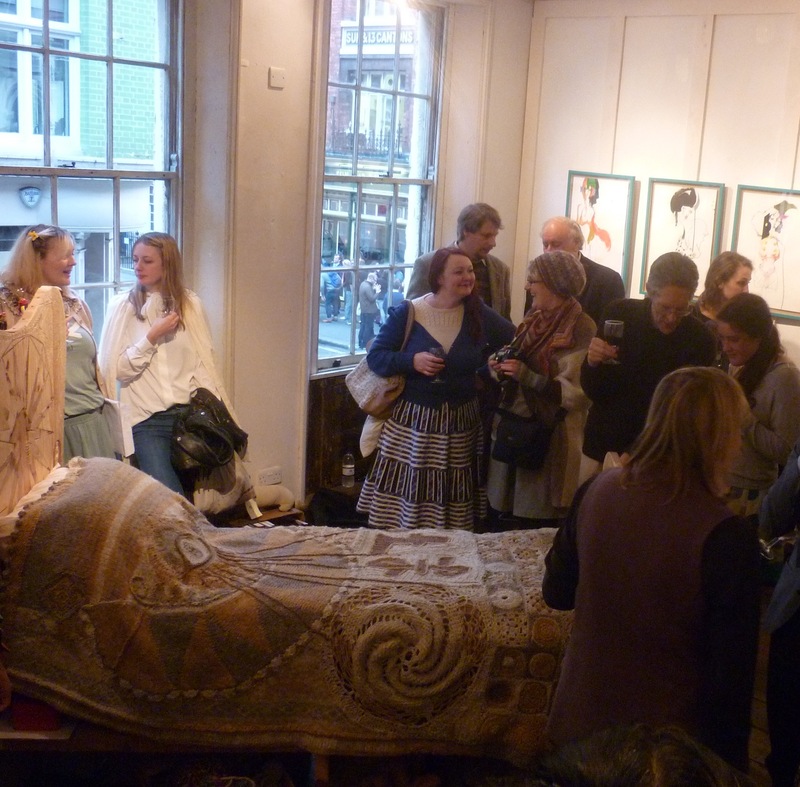 The fleeces are judged on, amongst others, resilience, crimp, uniformity, and presentation. 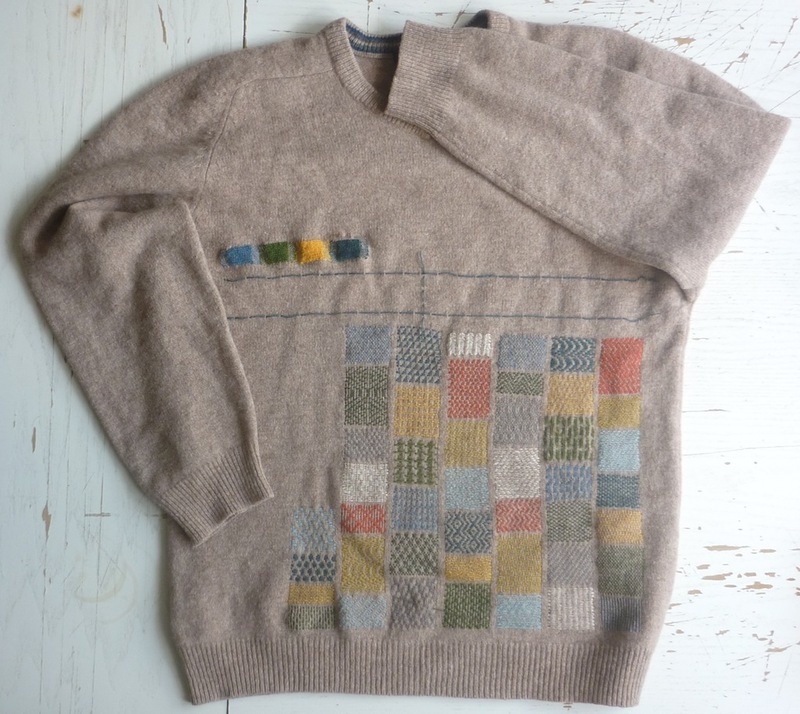 Readers of Jane Cooper’s excellent blog Mrs Woolsack’s Blog, may recognise this fleece. 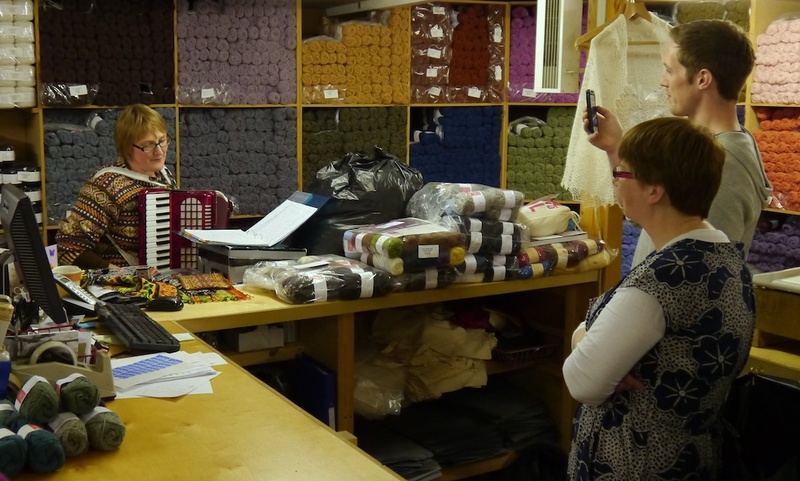 Incidentally, Jane also maintains the Woolsack website. 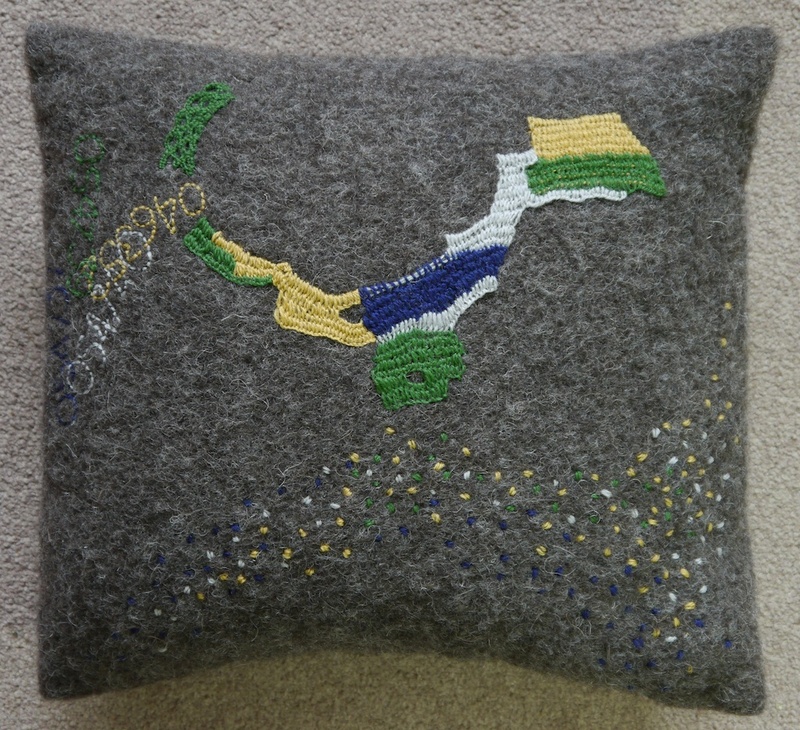 Woolsack was started as a Cultural Olympiad Inspire project to make British wool cushions as personal welcome gifts from the people of Britain to the London 2012 Olympic and Paralympic athletes. 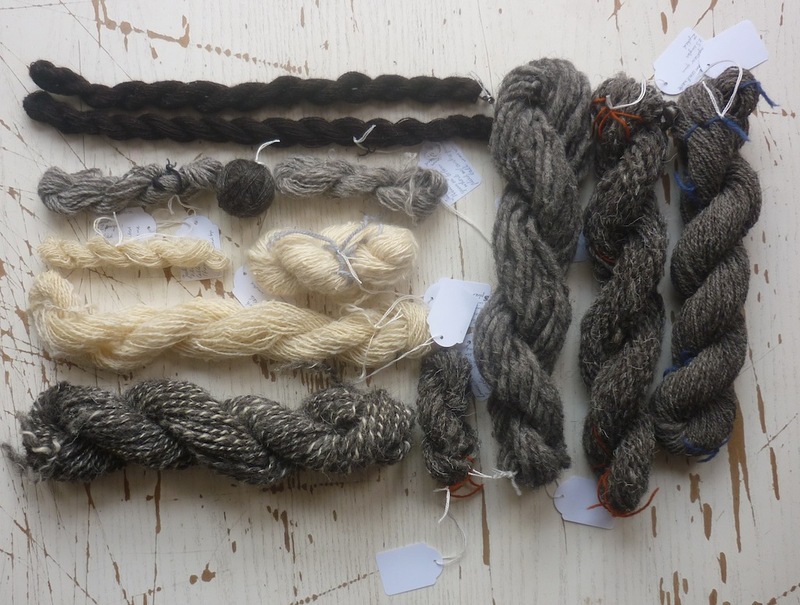 The Woolsack website now lists and links to information and sources of British wool products from spinning fibre to dyed knitting yarn and woven fabric. 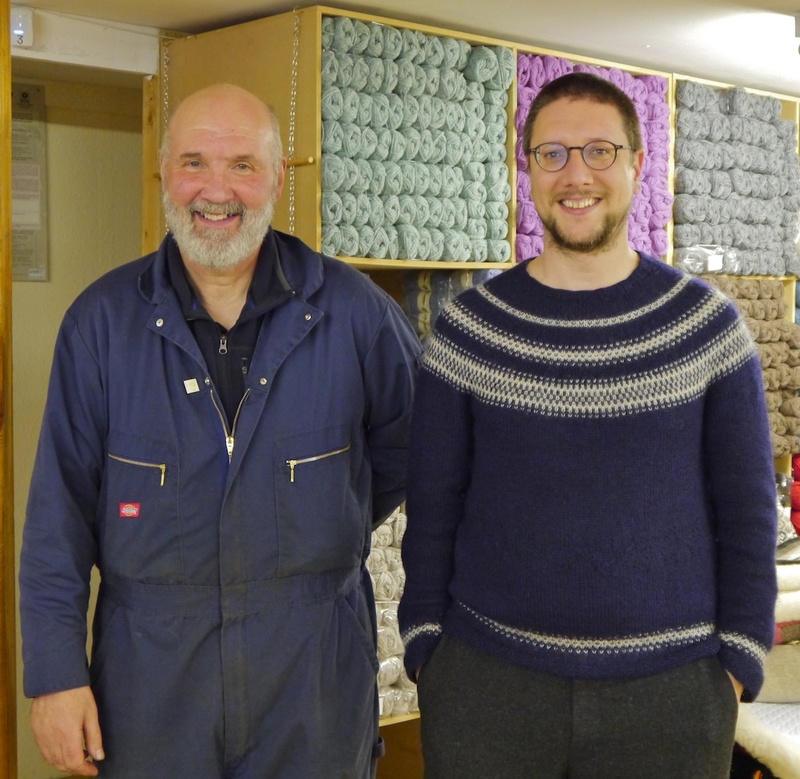 Here you can see me with the fleece judge himself: Oliver Henry, who is the Master Woolsorter at Jamieson & Smith. The keen observer will be wondering where that second song comes in, that for me is so inextricably linked to Shetland? 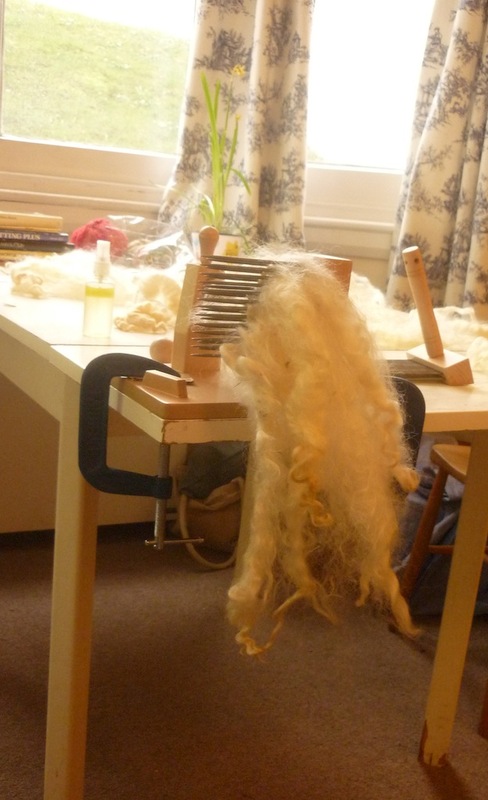 Well, as part of Felicity’s lecture Listening to Shetland Wool, she composed a song, which she performed at the end. 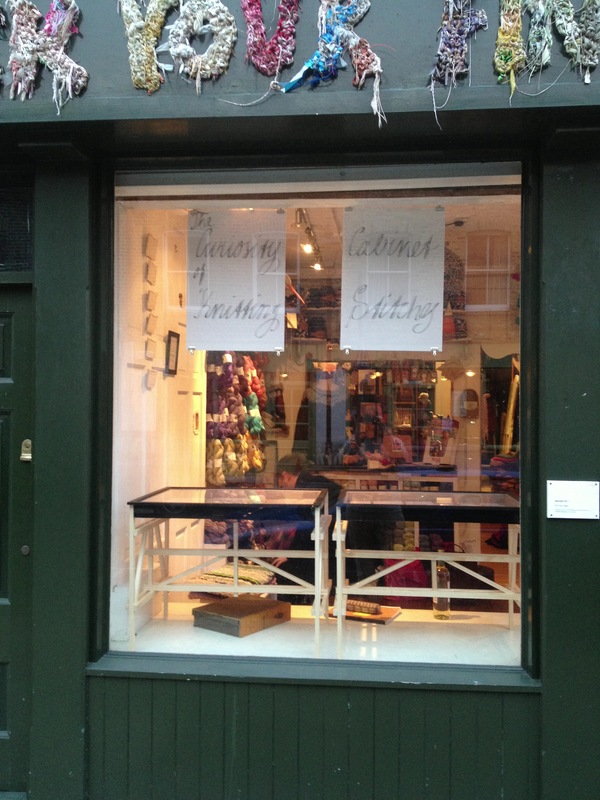 Here she is, performing it in the Jamieson & Smith shop. Sandra Manson and Adam Curtis are listening intently. As Felicity was fine-tuning the song during any spare moments we had at the lodge, I can sing it from start to finish. It has proved to be a great success, and indeed, it has found its way to the internet. One word suffices, as Oliver Henry said: BRILLIANT. 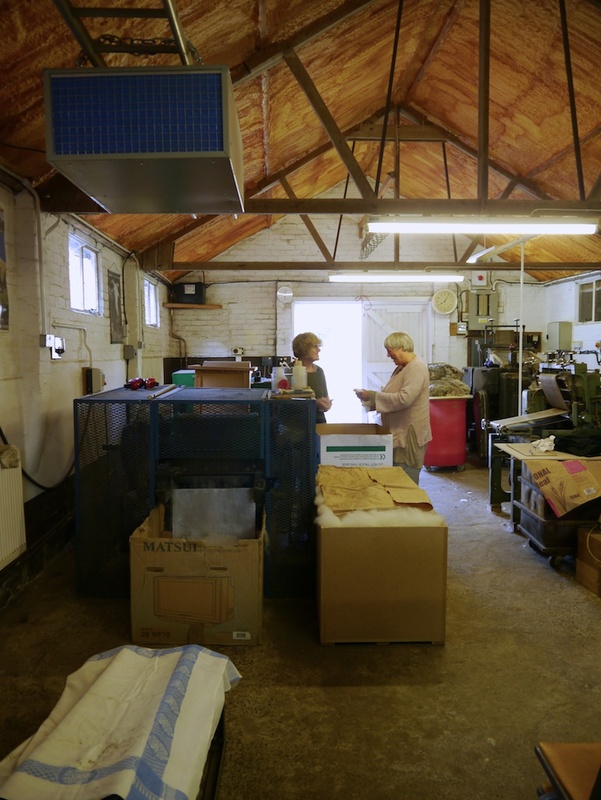 Last Friday I jumped at the chance to accompany my friend Sue to visit Diamond Fibres, a small independent spinning mill specialising in worsted spinning for knitting yarns. 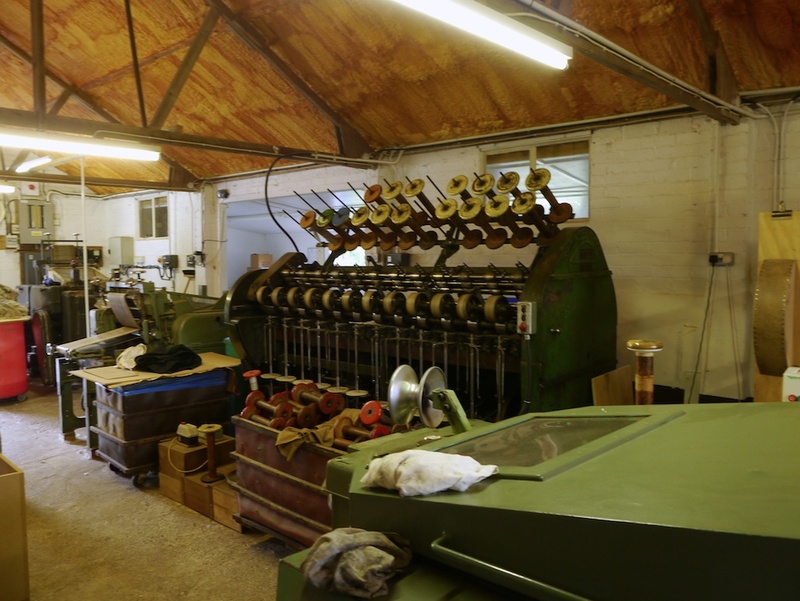 After Wovember2012, I had a greater understanding of how fleece gets turned into yarn, but to see a mill for real was an unexpected pleasure. 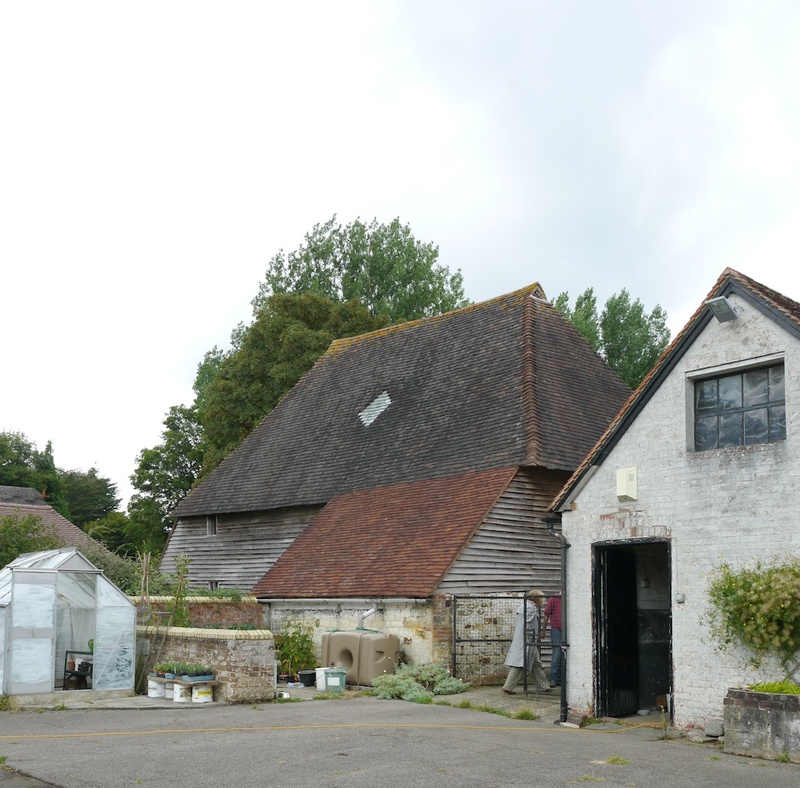 The mill is owned by Roger, who used to work in The City, but he quit in the 1980s to start the mill. 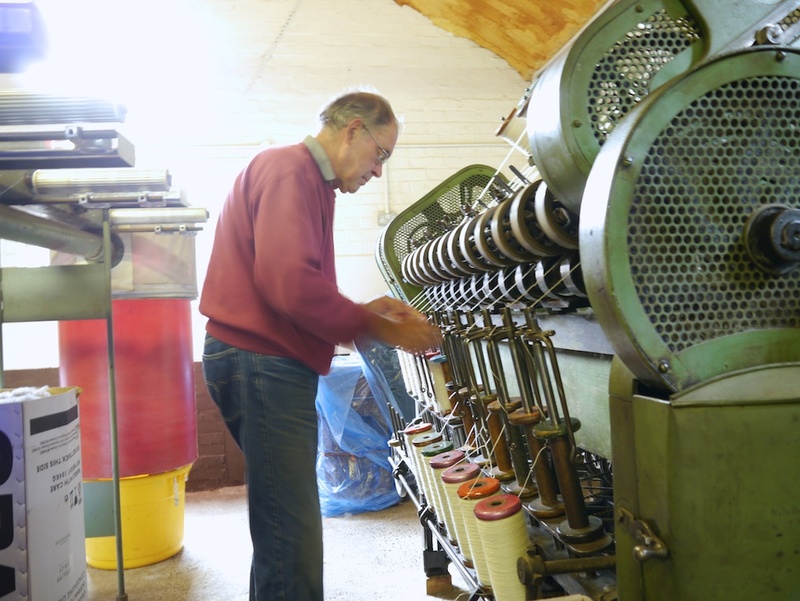 There’s a lot to do before you get yarn, and Roger does it all at his farm: fleece sorting, scouring, carding, combing, spinning, and skeining. It would probably take me a few visits to see all the machines working, as they’re not all continuously in use. Here’s an account of the process, as I remember it from the overload of information Roger gave me. 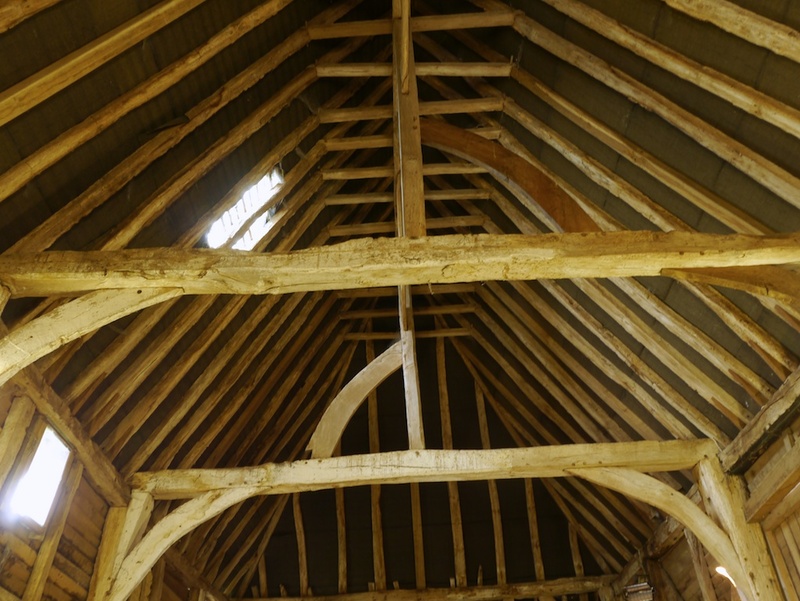 He stores his fleeces and does the sorting in an the oldest building at Diamond Farm: an old barn, probably dating back to the 14th century. 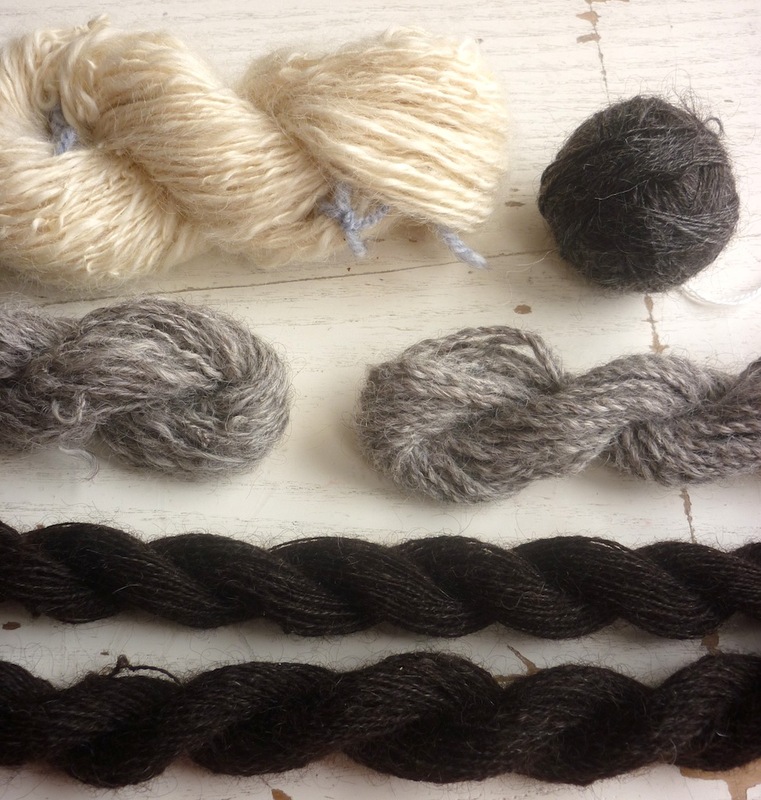 Once the fleeces have been sorted and graded, the wool gets scoured to remove dirt, suint and lanolin. This is necessary to ensure a high quality yarn. 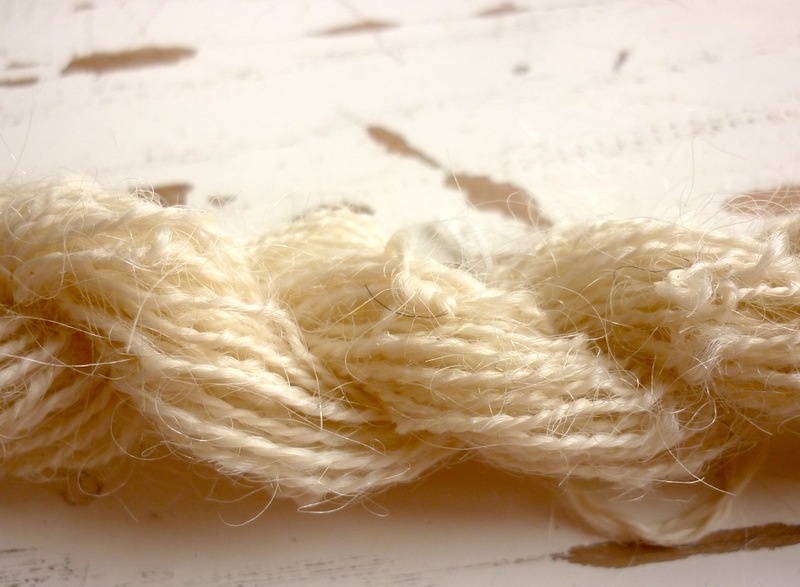 If there’s lanolin or or sticky stuff in the wool, then this gets transferred to the equipment, and soon fibres will start to cling to it, messing up the intermediate steps in the processing. 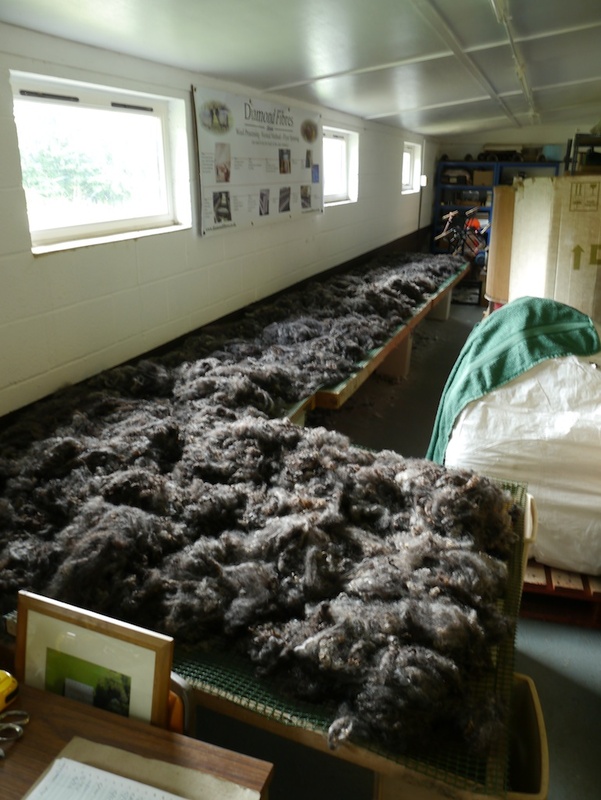 Wensleydale wool drying, there’s approximately 17kg of wool on the drying table. After the carding, the wool needs to be gilled: the jumbled up fibres get disentangled and gradually more lined up; if I understand it correctly, this produces sliver. 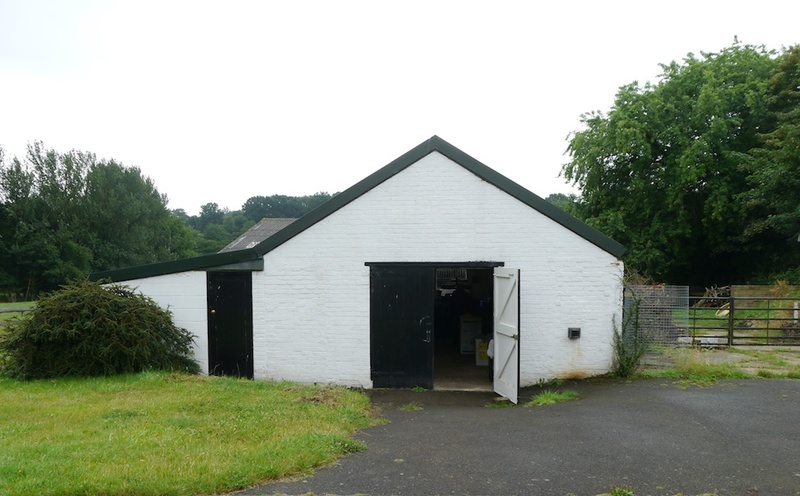 Unfortunately the gilling machine was not in use, but you can see some pictures of it here. 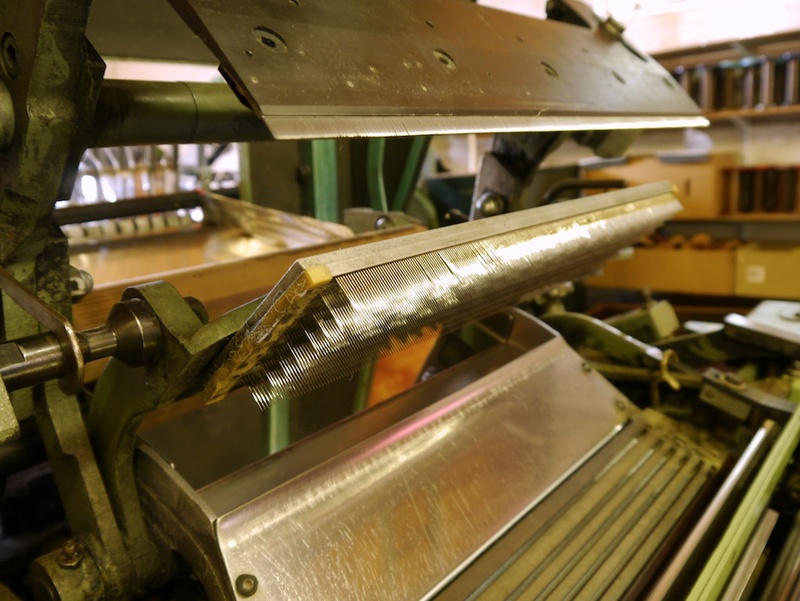 The sliver then gets combed, which is done rather differently than when doing it by hand. 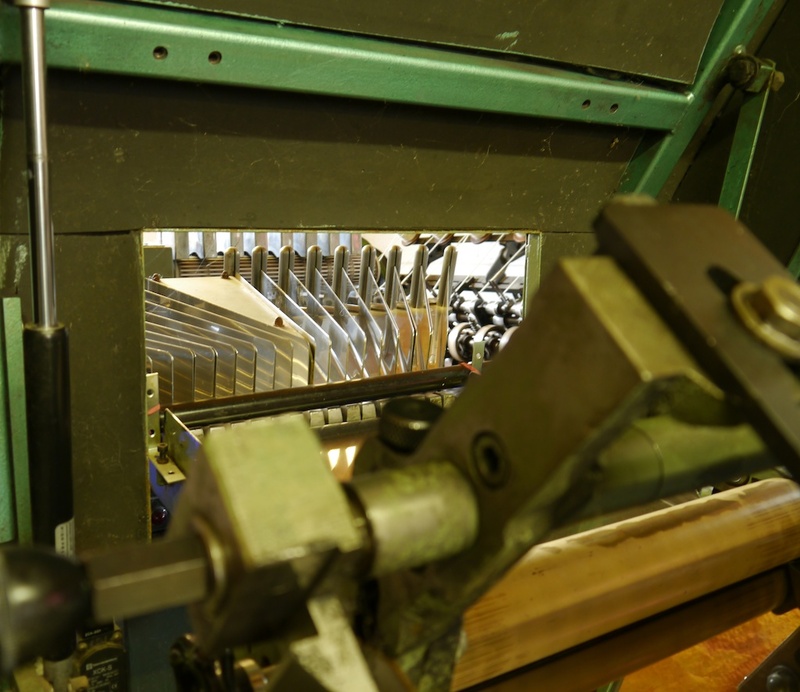 The sliver is fed into the combing machine at the back, 16 strands at a time. These slivers then get combed by a top comb and a bottom comb. The bottom comb was difficult to photograph, but it consists of a roller, with rows of tines on it, each row of tines smaller than the previous one. When the sliver has been combed, you get combed top. The combed top gets put onto huge bobbins. 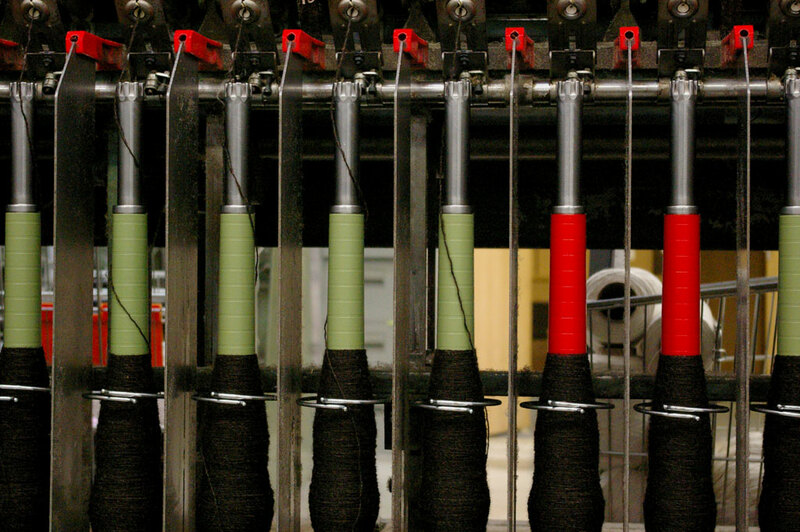 From there on, the spinning process itself starts. 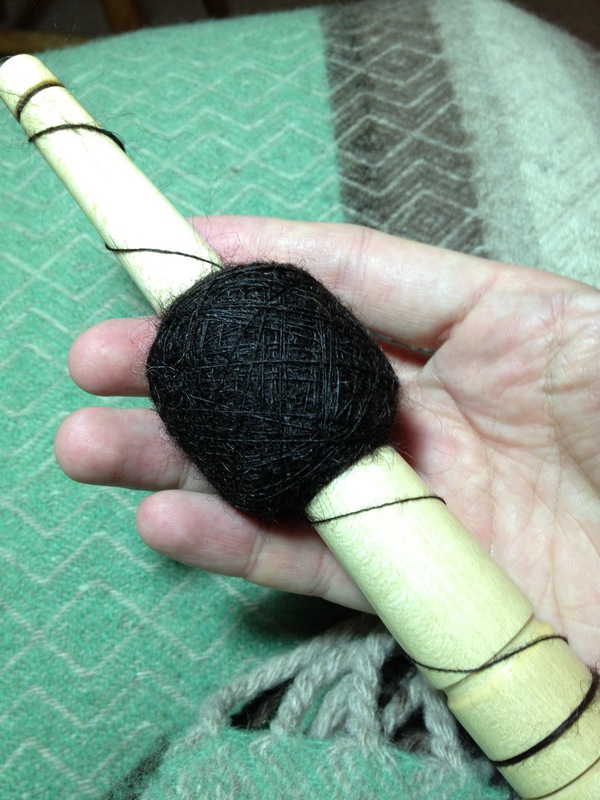 The combed top gets drafted into pencil roving. 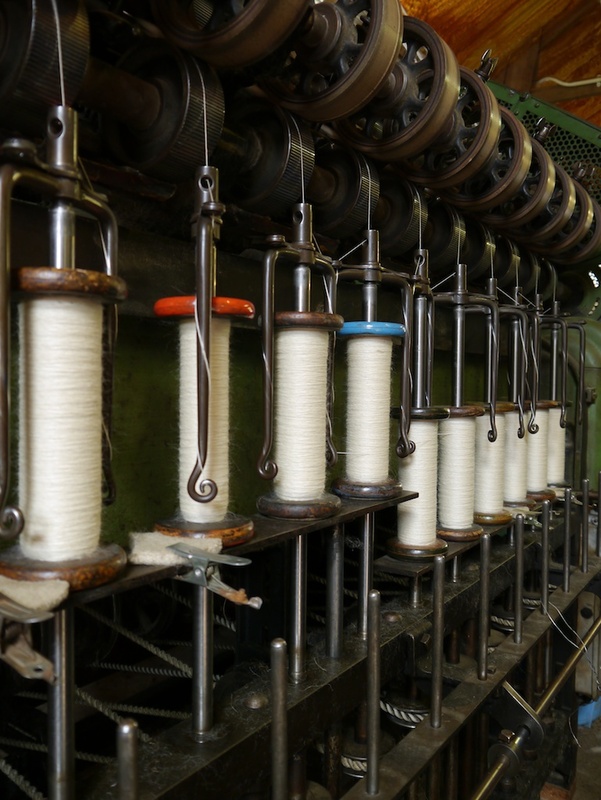 The bobbins with pencil roving are moved to the spinning machine, where the roving gets pulled through a series of rollers. Below you can see Blue Faced Leicester on the large bobbins. Bobbins with pencil rovings are drafted by the rollers. 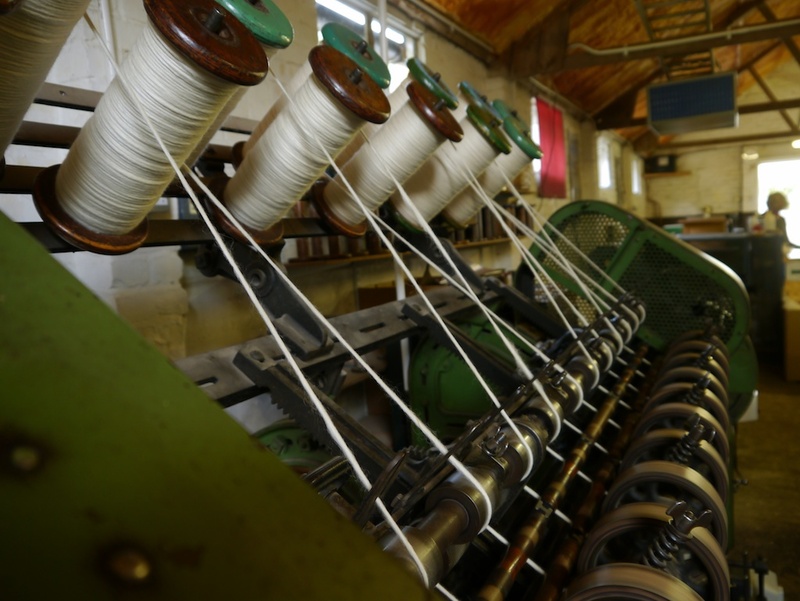 If the bobbin rotates too fast, the yarn can break, so some bobbins need to be kept in check by means of an additional brake. You can see them in the picture above. They’re the pieces of felt clamped into place right next to the naughty bobbins. 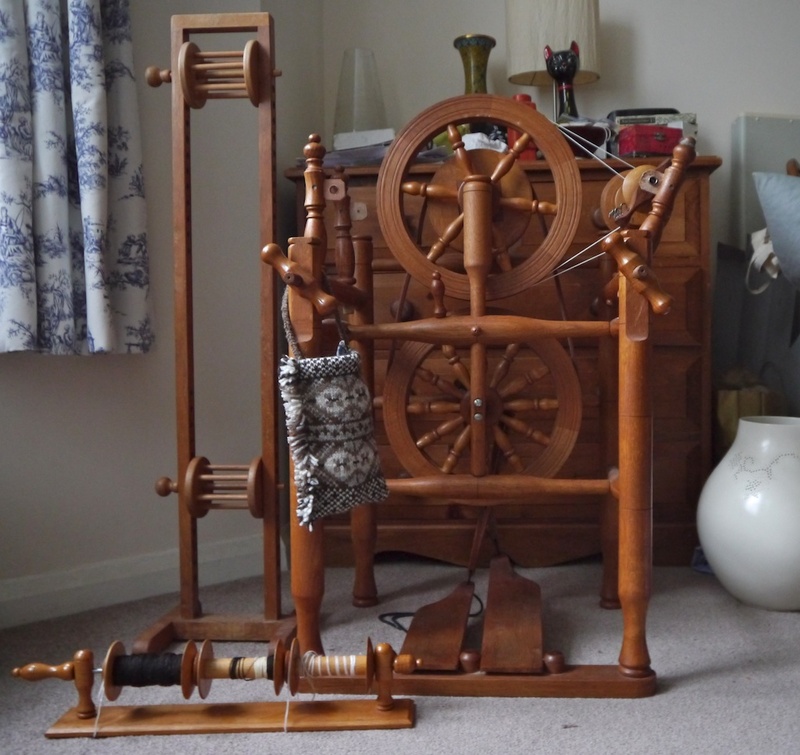 Although the bobbins with the single yarn spin around at an amazing speed, can you imagine that the large bobbins with the pencil roving will take a whole three days of spinning before they’re empty? Seeing that Roger has a flock of around 110 Romney sheep, it won’t surprise you to hear that Romney longwool is his favourite fibre to spin. 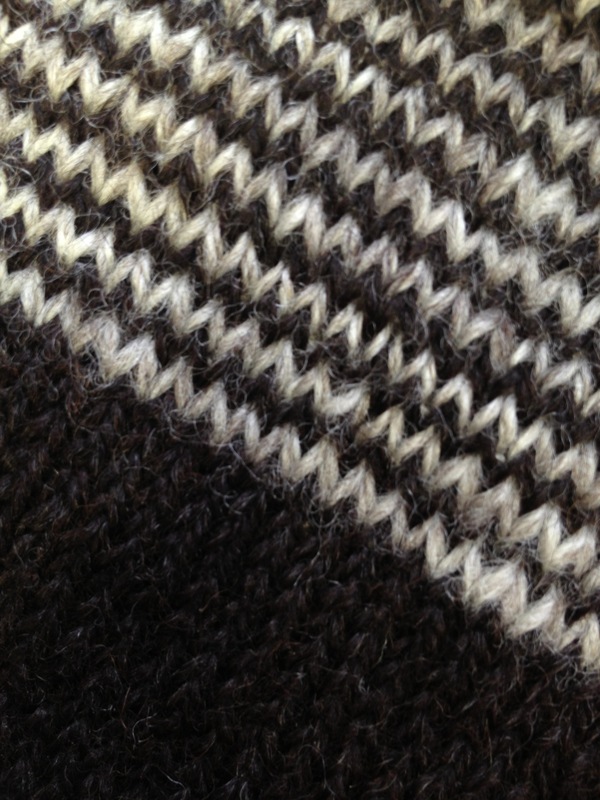 It has a nice lustre, it’s strong, and yet soft enough for a jumper; a good all-rounder. Knowingly and unknowingly I have been knitting with yarns spun up by Diamond Fibres. 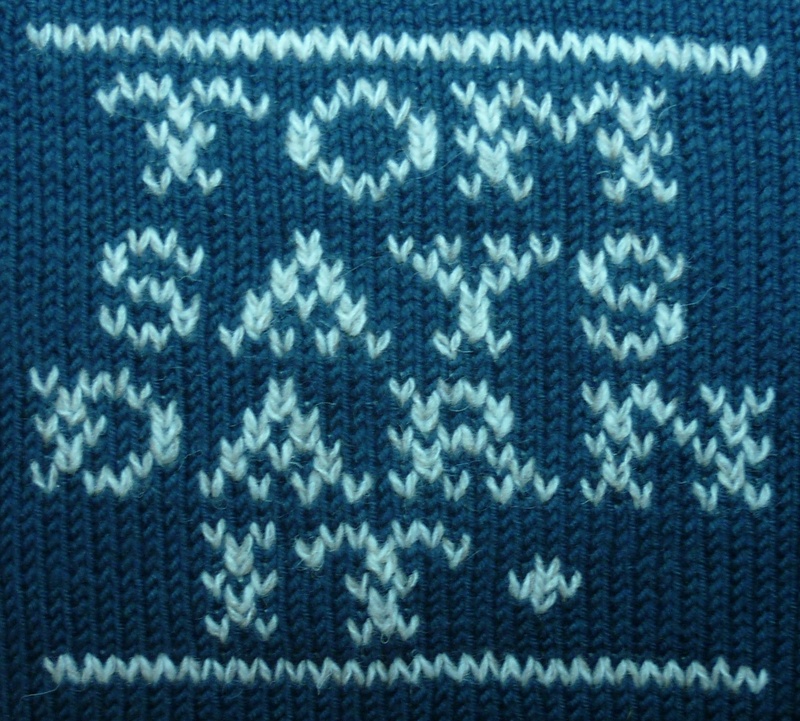 It turns out that the Wensleydale I used to knit a hat from, as reported during Wovember2012, was spun by Roger. 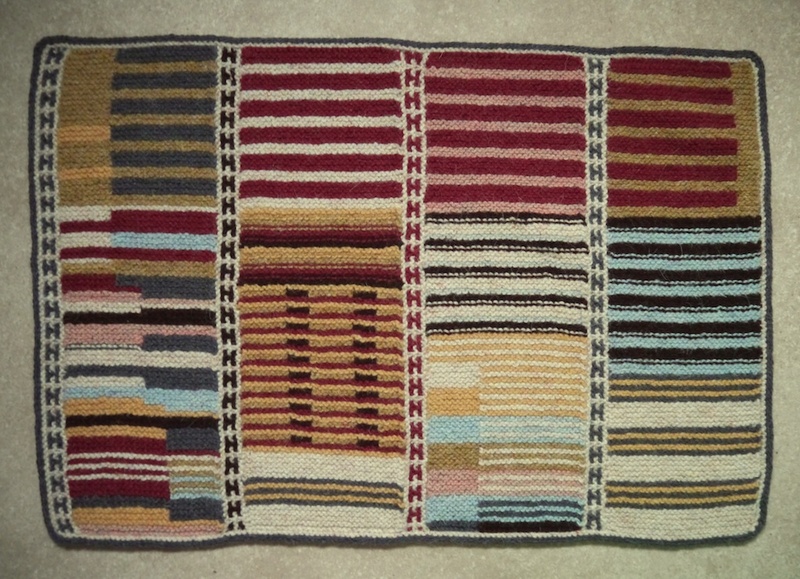 The picture above shows my Romney and handspun combination jumper I’m working on. Alas, it’s on hold right now as I have a number of commissions to complete before I can return to personal projects. 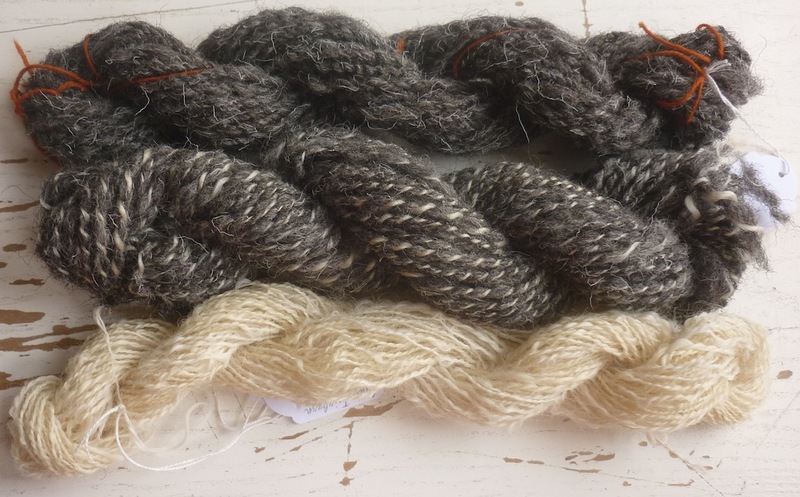 And you, too, can get your hands on some yarn made with care, showing off all the good qualities of Romney fleece, spun up by a Master Spinner. Prick Your Finger sell his DK weight Romney in deepest darkest brown, and also a beautiful steely grey. Post-script added on 18 August 2013: I have been back to Diamond Fibres, and got a few of the finer points clarified. You can read about it here.